The present monograph will accomplish its main purpose if it makes a slight contribution toward shifting the emphasis and point of view in the study of statistics in the direction of the consideration of the underlying theory involved in certain highly important methods of statistical analysis, and if it introduces some of the recent advances in mathematical statistics to a wider range of readers. The book presents one of the fundamental data modeling techniques in an informal tutorial style. Learn how to predict system outputs from measured data using a detailed step-by-step process to develop, train, and test reliable regression models. Table of contents: Statistics and Sampling Distributions; Point Estimation Basics; Likelihood and Maximum Likelihood Estimation; Sufficiency and Minimum Variance Estimation; Hypothesis Testing; Bayesian Statistic; What Else is There to Learn? Here I present statistics for the ordinary person. Examples are taken from ordinary life. 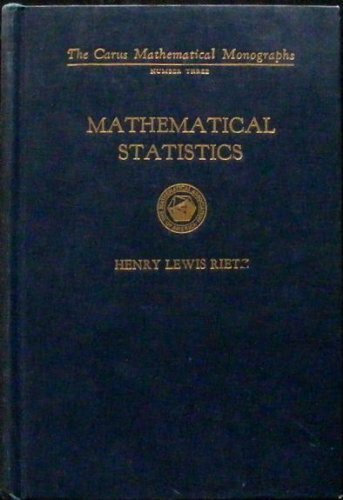 The book begins with basic concepts behind the statistics and never gets harder than simple arithmetic. The course is presented as a series of key ideas.